Brakes are one of, if not the most important safety devices on your car! They should be maintained and inspected regularly to insure your safety and the safety of your passengers. There is a simple way to determine if you need new brake pads. Just stop, look and listen! If your car doesn’t stop when you press on the brake pedal, that is a sign you might need new brake pads! If your car pulls to one side or the other when braking, or if the brakes grab or vibrate, those are also signs you might need new brake pads. Look at the brake pads. In order to really see the condition of the brake pads the wheels on the car need to be removed. If the pad depth is less than 1/4 inch, they need to be replaced soon. If you don’t trust your own judgment have them inspected by a professional. When the safety of your family is riding on your decision, don’t take chances. Listen for a high pitched squeal. Manufacturers have built a soft-metal wear indicator into the brakes to alert the driver when the brake pads need changing. Unfortunately, if you hear a grinding sound that means the brake pad replacement is long overdue and the worn brake pads may have damaged the brake rotors. Replacing your rotors can be a very costly job; so don’t let your brake pads get to this point! We are quickly approaching the time of year when snow is a good possibility and no one wants to be driving in the snow with brakes that might not work! So have your brake pads checked and replaced if needed. You’ll be glad you did! None of us want to be looking for an auto repair shop when our car is in need of major repairs, but finding a good repair shop can sometimes seem a bit overwhelming! 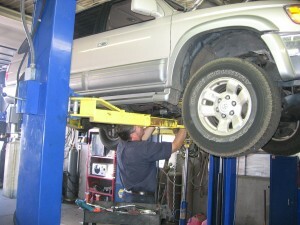 Here are some tips to help you find a good auto repair shop. Ask trusted friends, family and co-workers if they know a reputable repair shop. Word of mouth is usually the best form of advertisement. Ask them if the service they received was done on time and at the quoted price. Following the advice of people you trust is always wise. Check consumer reports online. The internet is a good source of information and you can find other opinions regarding certain auto repair shops, whether the experience was good or bad. Check with the Better Business Bureau. Once you find a shop you are interested in trying, they can tell you if there have been any reports filed against them. Simply log onto www.betterbusinessbureau.com for information free of charge. Ask about the mechanics training and credentials. Most mechanics will have a general certification and some mechanics have gone on to specialize in certain fields. Compare rates. There can be significant price differences between auto repair shops when it comes to parts and labor. Make sure you know and are comfortable with what you will be charged for their services. On your first visit to your chosen repair shop, look for a clean well-organized work area and office. This will give you an idea as to how they run their business. Do you expect to get good and dependable service if the place is a mess? Once you find a good auto repair shop and are pleased with your decision, let them know! We so often complain about the things we don’t like but fail to mention the things we do! Tell your repair shop when you’re happy with them and don’t forget to say a simple thank you when you pick up your car. 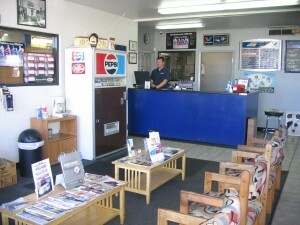 A few kind words can change a “good” auto repair shop into a “Great” one! Do You Want Adventure? Try Off-Roading! After spending a few days in the beautiful high country of Colorado off-roading, I can say without a doubt, it was a true adventure! The scenery was spectacular and the weather was great, but I wish I could say the same for the skills and knowledge of my fellow adventurers! Going off-road can be a fun and exciting experience but you need to know some basics before you hit the trail. 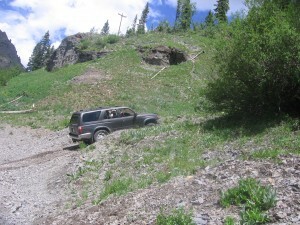 First you need to find a location for your off-roading adventure that is right for your level of experience. Since we live in Colorado our choices of trails are endless, but if the trail is too difficult you can put yourself and others in danger. So choose a trail that matches with your skill level. You also need to make sure your vehicle is in good condition and ready for the off-road experience. Have your vehicle thoroughly inspected by a trusted auto technician. Tell him your plans so they can help you avoid any potential problems before they arise. Check your tires (including the spare) to see if they have good tread and are properly inflated. It is also important to know how all the controls in your 4×4 work and how to use them. Don’t wait till you’re on a narrow trail to try them out! It’s always a good idea to know your vehicles dimensions; height, width, length, and the lowest point of clearance. Trails can be wide in some spots and very narrow in others, it’s important to know if your vehicle can maneuver through those tight places and clear rocks as you drive over them. It’s a lot more fun to share this adventure with friends, so get someone to go with you. If you get stuck it’s easier to get out and the “buddy system” is always safer. There are unwritten rules or trail etiquette that you should know. Stay on the established paths. Be aware of the damage you and your vehicle can do to the environment and do everything you can to prevent it. Keep your ego in check. Every vehicle and driver has limitations. Be aware of yours and don’t go beyond them. Don’t disturb the wildlife, just observe, don’t touch! Pretend you’re a tortoise. Just as in the old fable “the tortoise and the hare” slow and steady wins the race! You will enjoy the scenery and prevent damage to your vehicle. These are just a few of the things to keep in mind as you hit the trail. If your interest has been peaked and you want more information visit 4wheeldrive.about.com We live in a beautiful State and an off-road adventure is just one of the ways to enjoy it! Fuel economy is always important. But it’s even more important in the summer months when the weather is warm and we are spending more time driving to extra summertime activities. Here are ten simple tips to follow so you can spend less money on gasoline and more on other things. Regular Recommended Maintenance- Making sure your vehicle is well maintained will keep it operating more efficiently. Regular maintenance not only improves your cars performance, it also improves your fuel economy. Using the proper fuel (right octane) and the recommended grade of motor oil will save you money on repairs and improve your fuel economy. Check your owner’s manual for that information. Have your car serviced regularly by a trusted mechanic. Plan Your Trips- Make a list of your errands and combine as many as possible. When your engine is cold, it uses more fuel than when it is warm. Combining errands can improve your fuel economy because your engine is warm more of the trip. Keep Your Tires Properly Inflated- Properly inflated tires can reduce your gas consumption up to 3%. Tires that don’t have the proper inflation don’t roll as well which causes your car to use more fuel. Having the proper air pressure also helps you avoid uneven wear on your tires. Reduce Your Load- The heavier the vehicle the more energy is required to move it, so get rid of any unnecessary weight. An extra 100 lbs. will reduce your fuel economy as much as 2%. Empty your trunk and lose the roof rack if possible. A roof rack increases aerodynamic drag and therefore reduces your fuel economy. Maintain a Steady Speed- Sudden starts and stops decrease your fuel economy. Braking wastes energy from fuel that you’ve already burned and accelerating after braking consumes more fuel than driving at a steady speed. Driving at a steady pace improves your gas mileage and also reduces the wear on your brakes. Avoid Excessive Idling- When you leave your car running while you are waiting in line or in a parking lot fuel is being wasted. Your car is using fuel when it’s running even if it’s not moving. Be Smart About A/C- Whether or not you should use your air conditioning is determined by what kind of driving you are doing. If you are driving in the city with frequent stops for lights and at slower speeds, then lower your windows rather than using the air-conditioning. For highway driving it is more fuel efficient to close the windows and use the air-conditioning. Driving with your windows down increases the drag on your vehicle and burns more fuel. Check Your Air Filter- A dirty air filter will reduce fuel economy; it can also cause your engine to stall when idling. Your air filter should be changed at least once a year, more frequently if you live in a high pollution area or drive on dirt roads. Keep Your Tank Full- When you fill up your tank fill it completely, but don’t overfill, then try to keep it above one third full. If your fuel becomes too low your engine might not receive a steady supply of gasoline which causes your engine to run less efficiently. Buy your gasoline during the coolest times of the day if possible, the gasoline is denser when it is cool and denser gas helps your car run more efficiently. Use Synthetic Oil- Using synthetic oil can save you on average 5% gas. Remember to change it according to your vehicle manufacturer’s recommendations for any oil. Extending oil change intervals can be harmful to the life of your engine and fuel saving benefits are lost as oil gets dirty. Summer means barbecues, sunshine and vacations. For many families, summer also means multiple or extended car trips that could take a toll on the family vehicle. A few simple maintenance and driving tips before could save you a trip to the mechanic and several hundred dollars with extensive car repairs later. 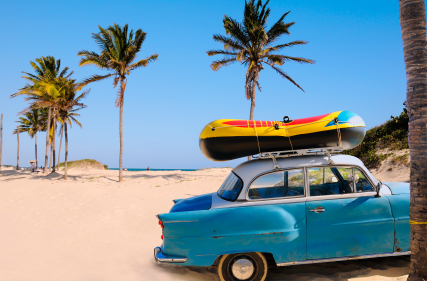 Before you hit the road, spend some time getting your vehicle ready for those blissful summer trips. 1. Check those fluids. Change or check your oil, coolant, brake fluid, clutch fluid and even your windshield washing fluid. A fresh supply of fluids can have a huge impact on your gas mileage and help prevent engine damage. 2. Keep an eye on your tires. Use a gauge to check the tire pressure; you car’s manual should provide specification for ideal PSI for your tires. Check the tread on your tire to be sure you have adequate grip in slick conditions. Make sure your spare is accessible and you have a jack and extra bolts in your car. 3. Have a mechanic inspect your car to make sure all of your systems are functioning properly, especially your cooling and air conditioning systems. Overheating can be a big problem, especially in hot summer traffic. Ask the mechanic to check your fans and oxygen sensors to avoid overheating. 4. Pack lightly. An overloaded car can decrease gas mileage and make a car run less efficiently. Over packing can also create dangerous road conditions if bag obstruct your mirrors and decrease your visibility. 5. Keep you emergency kit well stocked. A small kit in your glove box or trunk should contain bandages, jumper cables, a flashlight with batteries, water and nonperishable food items. 6. Increase the lifespan and efficiency of you engine with conscious driving. Avoid stop and go driving; if you drive a manual, use shifting to your advantage by maintaining consistent speeds. Utilize your cruise control to increase your fuel economy. Not only will you improve your gas mileage but you’ll also lengthen the life of your engine and brakes. Got an older car? Chances are you’ll have a problem or two along the way. Because you’re saving money by not having a car payment every month, an occasional repair can far outweigh the costs of having a new car. Yet even an older car can be a good, reliable means of transportation. You just have to keep it well maintained month after month, and know how to troubleshoot along the way. Start by knowing and listening to your car. Because you drive it every day, you’re the first person that should recognize when something is wrong. Is it making a new sound? Does it perform differently with the changing seasons? Pay attention to anything your car is trying to tell you. Do a little research online. Google can provide you with a wealth of information – do a quick search and your questions can be answered in no time. Also find a local auto shop that cares enough to put quality information up on their website, to help provide you with the necessary information to keep your car healthy. Make regular appointments for routine maintenance. Fill all your fluids periodically. Change your oil. Replace worn parts such as belts and wiper blades. Keep tires at their optimum level. Stick to manufacturers guidelines to ensure the best chance for a well running car. And keep a local repair shop at hand for quality auto repair advice. It’s nice having someone you can rely on for great advice, knowing they will never steer you wrong. Your car’s brakes may be the most important safety component of all of your car’s systems. Because brakes are hidden from plain view, many drivers don’t consider their brakes until they need repairing. Most people don’t realize that their brakes are in need of repair until a serious problem pops up during a driving situation. Though brake failure is a glaringly obvious sign of brake problems, there are several other indications that it may be time to take your car to a mechanic to have the brakes checked. It’s very rare for a braking system to fail entirely without presenting any previous stopping problems. If you feel like you need to apply more pressure than usual to stop your car, you should have your brakes checked. Difficulty stopping is most often indicative of leaking brake fluid. If your brake pads are worn or damaged, your brakes will start to squeal. Squealing is actually a sign that your car is doing what it’s supposed to! When your brake pads wear down, the brake itself rubs against a wear indicator in your car, which causes squealing to alert you to the problem. If you hear squealing, get your brakes repaired through a simple pad replacement. If your brakes are making a grinding noise, it’s likely that they had been squealing but had gone unrepaired; grinding brakes can cause more serious damage or even brake failure, so get to a mechanic right away! If you feel like your brakes are vibrating, throbbing or pulsing when you apply pressure, you need to have your brakes repaired. When brakes are exposed to heat or water over long periods of time, they can become misshapen or warped which causes them to vibrate. Warped brakes are more likely to perform inadequately; you’ll need to have your brakes replaced to avoid serious danger. 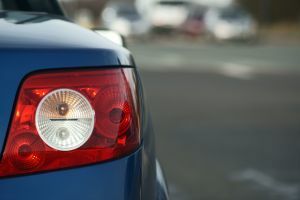 Unless you have an electrical problem, your brake light is your best bet in alerting you to a need for brake repair. Antilock braking systems use wire sensors that detect problems with a braking system. 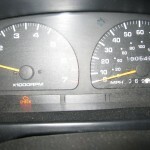 A lit ABS light indicates a brake problem in need of repair or a faulty ABS wire sensor. Either situation requires repair to keep you safe on the road.